Roughly speaking, the conditional tense translates as ‘would’, ‘should’ or ‘could’ in English, although not necessarily with the same sense of obligation. Most frequently, it expresses the idea that a event depends on some other factor – for example, ‘we could go tomorrow if the weather’s nice’, ‘I would do it if I had time’, and so on. It indicates outcome rather than the condition itself. 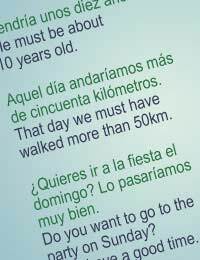 As with the future tense, the conditional may not be the most common expression in Spanish, but it’s well worth gaining a firm understanding nonetheless. You will come across it, and need to be able to recognise it. To form the conditional tense, use the same stems as for the future tense (see the separate article on this site.) Remember, that stem is the infinitive. The stems that are irregular, listed in the article about the future tense, apply to the conditional in the same way they apply to the future tense. He must be about 10 years old. Aquel día andaríamos más de cincuenta kilómetros. That day we must have walked more than 50km. ¿Quieres ir a la fiesta el domingo? Lo pasaríamos muy bien. Do you want to go to the party on Sunday? We’d have a good time. Sería una locura salir por la calle en Nueva York en enero sin llevarse un buen abrigo. It would be crazy to go outside in New York in January without a good coat on. Si ganara el sorteo, me compraría una casa enorme. If I won the lottery, I’d buy myself a huge house. In some styles, especially in journalism and particularly in Latin America, the conditional is used for rumours or unsubstantiated reports. Some rigid grammarians roundly condemn this practice. Gregorius habría nacido en Glasgow. Gregorius was apparently born in Glasgow. Según nuestro enviado especial, la desaparición de los etarras estaría motivada por cuestiones de seguridad. According to our special correspondent, security reasons are said to be the motive for the disappearance of the ETA members. Dijo que lo haría luego. He said he’d do it (was going to do it) later. Finally, you should be aware that sometimes the past imperfect tense (again, this is explained in more detail elsewhere on the site) is used in place of the conditional. This is particularly true of colloquial language.